Yang received the Nobel Prize in physics together with his colleague Tsung-dao Lee in 1957 for their theory of parity nonconservation. (Ecns.cn)--As a biography of Chen-Ning Franklin Yang, a Chinese-born physicist and Noble Prize winner, was published by the Joint Publishing Company last month, stories of the so-called "most normal genius" in physics grabbed the public's attention once again. Yang received the Nobel Prize in physics together with his colleague Tsung-dao Lee in 1957 for their theory of parity nonconservation, which posits that weak force interactions between elementary particles do not have parity (mirror-reflection) symmetry. Yang won many other awards thereafter, including the Rumford Prize (1980)， National Medal of Science (1986)，Benjamin Franklin Medal (1993)，Bower Award (1994)， Albert Einstein Medal (1995)，N. Bogoliubov Prize (1996)，Lars Onsager Prize (1999)，and King Faisal International Prize (2001). In an interview with the China News Week, Yang attributed all his achievements to "luck." He said he had made the right choices at every turning point in his life. He is quite right. People just couldn't believe his luck in 2004 when he, then 82, found his significant other, a woman 45 years younger than him. The marriage was commented on by Yang as his "last gift from God." Born to a mathematician from Tsinghua University in the Republic of China (1912-1949) in Hefei, Anhui Province, Yang earned his bachelor and master's degrees at the National Southwestern Associated University. From 1946, Yang studied at the University of Chicago, where he received his doctorate in 1948. A year later, he moved to the Institute for Advanced Study where he began a period of fruitful collaboration with Tsung-Dao Lee. In 1966 he moved to the State University of New York at Stony Brook and became the Albert Einstein Professor of Physics and the first director of the newly founded Institute for Theoretical Physics, which is now known as the C. N. Yang Institute for Theoretical Physics. Deeply influenced by traditional Chinese culture before he went to the States, Yang visited the Chinese mainland in 1971 for the first time after many years of estrangement and antagonism between the two countries. He has subsequently made great efforts to help the Chinese physics community to rebuild the research atmosphere which was destroyed by the radical political movements during the Cultural Revolution (1966-1976). After retiring from Stony Brook, he eventually returned to China as honorary director of Tsinghua University, where he had spent some of his childhood. 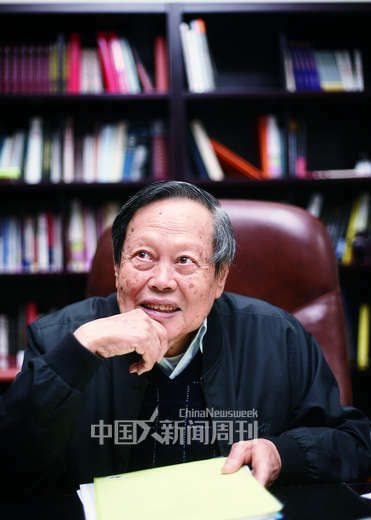 Yang said he came back to Tsinghua because former president Wang Dazhong had invited him in the 1990s to help build a world-class school and he himself wanted to do his bit. "It was something that I was quite willing to do, and it was worth the try," noted Yang. "And now it seems that I have made the right decision. My efforts are being paid back," he added. "Our undergraduate students now show up prominently abroad, especially those majoring in condensed matter physics."